The Show Business Observatory is the study and data collection centre of the Italian Society of Authors and Publishers. One of the tasks of the Observatory is monitoring all-round activities of the show and entertainment business in Italy, with analyses of concerts, cinema, operas, musical comedies, ballets, exhibitions, travelling show attractions. It is a very important activity, providing fundamental information and a key to the interpretation of the state of the show industry in Italy. The Show Business Observatory regularly publishes the statistical analyses it has carried out; regular publications include Statistical Show Business Yearbooks, which have been published since 1936, the Semester Trends, published since 2006, the Seasonal Trends of the Show Business and the project FiveYears of Cinema. Publications and archives are available on line and can be downloaded from the section Virtual Library. Paper publications can be consulted at the Library housed at SIAE’s Headquarters in Rome, Viale della Letteratura 30. The Library is open to the public from Monday to Thursday from 9.15 a.m. to 1.15 p.m. and from 3.00 p.m.to 4.30 p.m. and on Friday from 9.15 a.m. to 1.15 p.m. Moreover, the Show Business Observatory can prepare collections and analyses of statistical data for special purposes, meeting any information needs of external entities, bodies and public and private institutions. Data relating to the first six months of the year offer important signals of tendency on the trend of the show during the year. The half-yearly publication exposes information on indicators of the show with a level of territorial deepening greater to those found in the Yearbook of the show. For this reason, although it is a provisional processing, the half-yearly figures provide important and useful insights on the world of entertainment. The data analysis on seasonal trends is focused on the result achieved during the canonical seasons of the show usually concentrated between the months of September and June of the following year. This particular point of view assumes a different degree of importance according to the examined sector: it is considered to be of particular relevance in the case of studies concerning cinema, theater, classical concerts and the championships of the major team sports. The study focuses on the information contained in the statistical records of the SIAE and has been enriched in recent years of increasingly qualified information and of greater detail, such as the encoding of the organisers, venues and geographical areas of the country. In this way the project Five years of Cinema is able to offer a comprehensive and valuable overview of the industry status in Italy. The publication pages show the result of the analysis with regards to the different indicators of the show. ● spending at the box office. The tables are sorted by region, province and municipality. They also show the data relating to the detection of the number of screens with an indication of the total number of screens detected and those that have hosted at least 60 performances in the year. In the fall of 1934, at the Accademia dei Lincei, at the Fourth Conference Volta, the former President of SIAE, Dino Alfieri, presented the report on the situation of the Italian show.From that report, a few months later, resulted the first publication of SIAE focused on the statistics of the show titled "Life of the show in Italy in the decade 1924-1933 ". 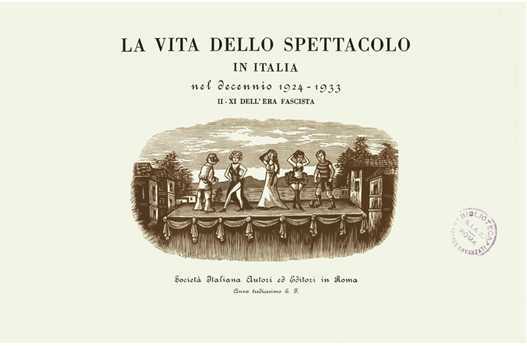 Download the PDF "The life of the show in Italy in the decade 1924-1933"
Since 2013, the Ministry of Cultural Heritage and Activities and the Tourismhas been publishing annually, on the pages of its website, data collected and processed on the show as part of the "PanoramaSpettacolo" project. The project was conceived by the Directorate General for Live Entertainment and Directorate General for the Cinema,with databases provided by the Statistical Office of the SIAE, with the aim of creating a timely monitoring system of the places hosting entertainment activities. Based on the data submitted since the yearbooks of Entertainment 2006, the Italian Society of Authors and Publishers has implemented a project of dynamic data visualization. In this section a different criterion is proposed to display the data of the show, based on the dynamics of the indicators Using a series of drop-down selectors, you can identify the summarized interest values for the period of observation, type of event and for geographical context.